Rigging is the final and, for me, one of the most confusing steps in the boat building process. Each day I go to the garage and make a little bit of progress, but it’s hard going. There are dozens of bolts, pulley, turnbuckles and chains–and yards and yards of nylon line. I feel like I am both the spider and the fly—catching myself in a web of my own making. Just a small sample of the hardware used to rig the boat. Note the pulleys, turnbuckles, clips and role of wire rope. For an experienced sailor, the work might be easy. But for me, every step is a voyage of discovery. “Oh, so that’s how I raise the sail,” I exclaim as I examine the various pulleys and lines that link the gaff to the mainmast. “Well, that makes sense,” I think as I study how the mast is secured with wire rope and clamps. I am learning to sail simply by learning how my boat is rigged. Along the way, I had a small revelation. Rigging is really the most important part of the boat. Without a thoughtfully rigged boat, you don’t really have a workable craft. Are you laughing at this obvious insight? Go ahead, but look at it from my perspective: I have spent two years building the hull and cabin, worrying every day about its shape and whether or not it would float or sink. In terms of time and materials, the hull felt like the main act. Of course, the sail and mast were exciting additions—they made a sailboat sail—but I didn’t appreciate their complexity and importance. Until recently, I viewed them as oversized curtains. But as I begin assembling the pieces—attaching the boom, hanging the sails, sliding the gaff over the mast—I realize that everything above the cabin is part of complex, interconnected machine. Every piece has a functional purpose, and each piece must relate to all other pieces in a harmonious way. A sailboat with poorly designed or incorrectly built rigging would be like a car with an untrustworthy engine. It doesn’t matter how cool you look if you break down or can’t maintain control. I also realize that my inexperience with building and sailing means that I am probably making countless small mistakes that will certainly cause countless small frustrations when I finally drop the boat in the water and raise the sails. Already, I can tell that I don’t like my tabernacle and that my mast hoops are too small. But I am reassured by comments from fellow boat builders who tell me that rigging is not a one time effort, but an ongoing project—tinkering and refining is simply part of the process. My goal for the moment is to assemble something that is workable, not flawless. 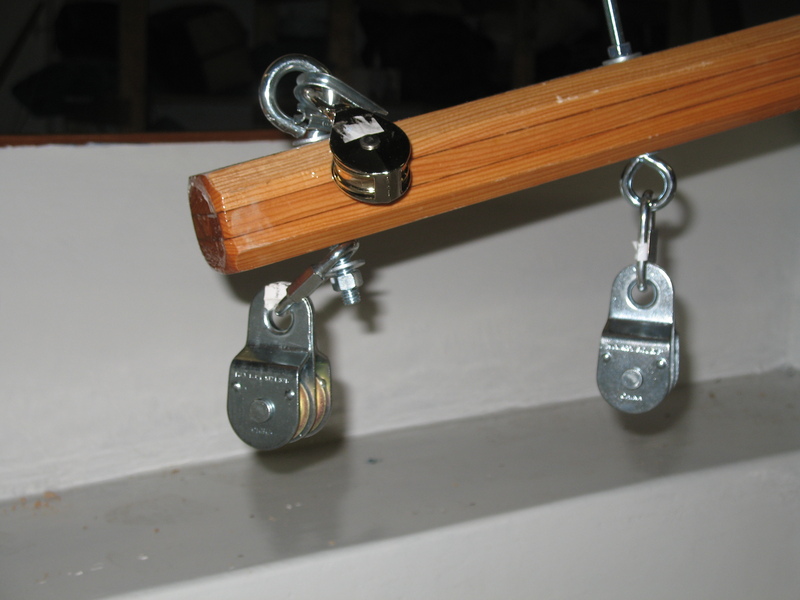 Steel bars, quick links, turnbuckles, and chain attach the bowsprit to the hull. I began with the bowsprit, which looked fairly straightforward and self contained. As you might recall, I cut the actual bowsprit a couple of months ago from a piece of 2×3, but not until week or so ago did I finally attach it to the boat with chains. In theory, this was a simple project but, like everything else, it took much longer than expected. To attach the three lengths of chain, I needed an impressive assort of hardware, including eyebolts, steel bars, quick links, and turnbuckles. 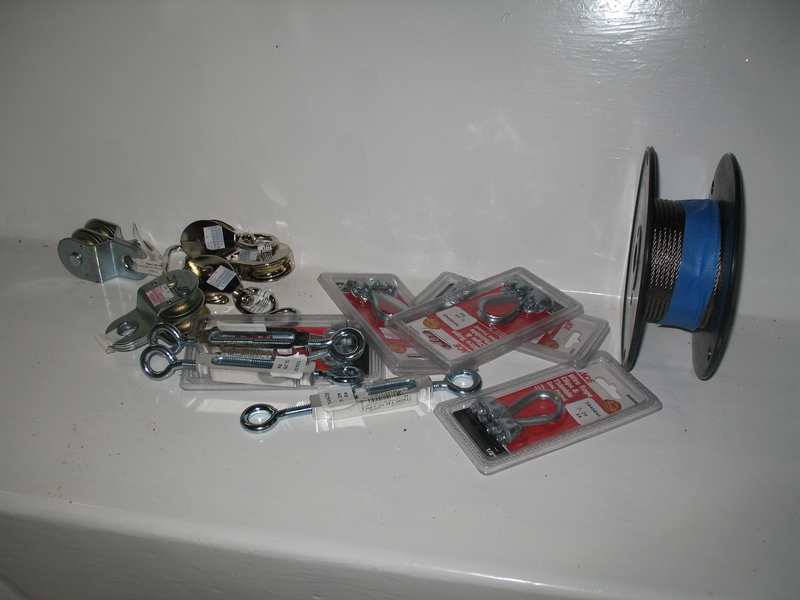 Until recently I had never heard of a “quick link” and had never used a turnbuckle, but by the time I had made my third trip to the hardware store, I was fully acquainted with the turnbuckle/quick link/eyebolt aisle. Remarkably, my local Ace Hardware affiliate had everything I needed. I complemented the salesman on his store’s attention to the needs of boat builders, but he didn’t get the joke. It seemed like a lot of work for a small addition to the boat, but as work progressed, I came appreciate the importance of the bowsprit. 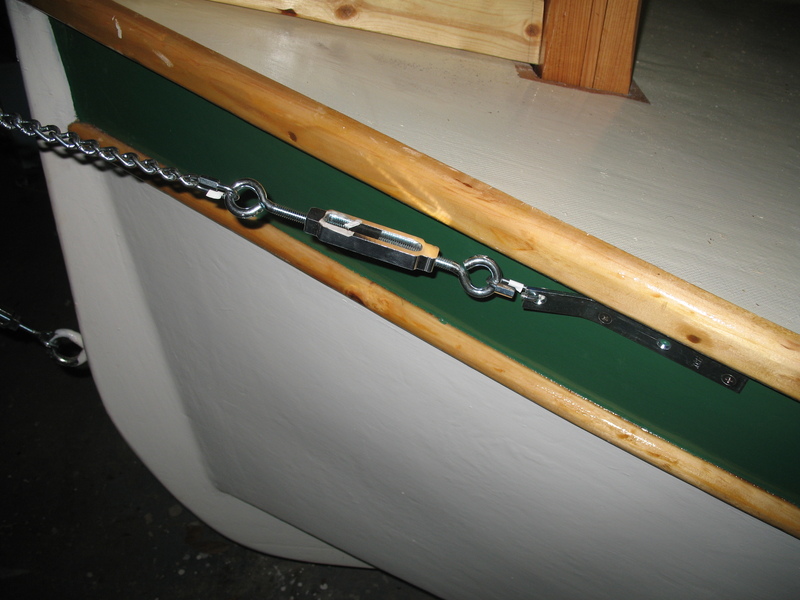 For a long time, I considered it a decorative addition and the chains mere jewelry, but I began to realize that strong chains are needed to secure the bowsprit so it can support both the jib (the small forward sail) and the forestay (wire rope used to securely hold the mainmast upright). Again, the point was reinforced: Every part serves a purpose. Various double and single pulleys are attached to the top of the mast. Next, I turned to the mast. Here I had an opportunity to hang several double and single pulleys that will, in time, help me hoist and drop the mainsail. I had never used pulley before and I was thrilled that I finally had a use for this elegant and ancient technology. In the coming days, I will run the lines through the pulleys and finish lashing the sail to the boom and gaff. With the stays attached to mainsail, I look forward to the next and possibly final milestone in the building process: raising the sail. I can’t think of anything to do after that. It must be nearly time to hit the water. Sailmaking is one of the great and ancient mariner arts. It conjures images of crusty old sailors sitting on barrels surround by yards of cotton canvas and pipe smoke as miles of thread are worked through fabric. Unfortunately, my approach to sailmaking is considerably less romantic. The completed sail. My son is keeping it from flying away in the wind while I stand on the roof of my workshop to take this photo. First a little background. My research over the past two years suggested three possible routes to the acquisition of sails for my Pocket Cruiser. First, I could purchase ready-made sails for about $600. So many Stevenson boats are built that several companies (including the boat’s designer) offer sails that are just right for my boat. That’s the fastest and most expensive route. I just place my order and wait by the mailbox. Secondly, I could buy some Dacron sailcloth and sew my own sails. It sounds intimidating, but it is doable. Boat designer Jim Michalak has a detailed discussion of sailmaking in his novice-friendly book Boatbuilding for Beginners and Beyond. For anyone who knows how to use a sewing machine (and I do), this is a worthy option. The downside is that even inexpensive sailcloth costs real money and I assume that a serious time commitment is involved. Finally, there is the quick and cheap option. A growing number of backyard boat builders get on the water without delay by cutting a workable set of sails out of large plastic tarps—the kind used to cover outdoor furniture in winter or protect a woodpile from rain. They come in surprisingly large sizes and advocates say they are nearly as durable as Dacron—at least for a while. Instead of thread to sew their sails, these guys use guy materials—duck tape for the seams and grommets for the lashing. In an afternoon, I learned, it’s possible to turn a very large sheet of polytarp into a fully finished sail. Polytarp sails are not perfect. While reasonably sturdy, they don’t last nearly as long as real sails, I am told. Pete Stevenson, my boat’s designer, admitted that they are generally good for a “season or two.” He and others recommend against their use on long voyages. This leaves me wondering how they will fail. Do they degrade and rip? Do the grommets pull out? My suspicion is that the duck-taped seams will peel and shred. But in either case, the consensus is that they are a functional but short term solution. On the other hand, they are cheap–and that tipped the balance. 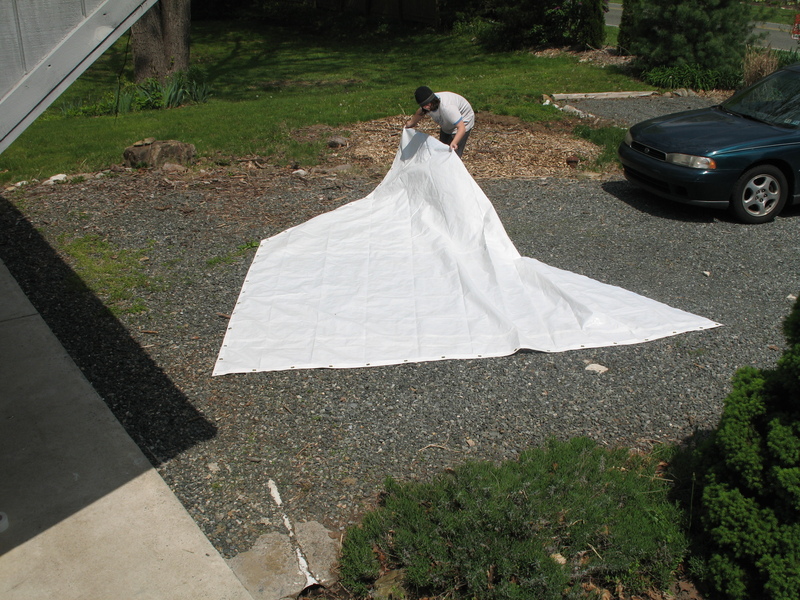 I purchased a large 16’ x 19’ polytarp from an online supplier for about $70 last fall (sailmakers are not limited to green or blue tarps found in home centers; I chose a plain white material). For taping the edges, a single small role of duck tape is enough. The grommet kit is also economical. The actual work is really just a matter of drawing several long lines and cutting out a very large triangle-ish shape. But the work is not without its small challenges. First is the problem of workspace. I discovered that I do not have a flat surface anywhere on my property that is 16 feet wide and 19 feet long. My garage is large, but all available floor space is now occupied by my boats. Outside, my bumpy, sloping yard was entirely unhelpful. My driveway is gravel, and not suitable for careful measurement and cutting. In hindsight, it would have made sense to cut my sail two years ago when I could roll the tarp out on my not-yet-cluttered garage floor. That’s actually Jim Michalak’s recommendation. Sails take up about as much space as the boat, he argues, so use your floor space to make the sail when you still have the space available. It’s sound advice, although I don’t know if I would have followed his recommendation even if I had read his book two years ago. I was too eager to start cutting wood. My imperfect solution was to roll out part of the tarp in the garage, draw a couple of lines, and then roll out the other side and draw the rest. It took a long time and made me worry about inaccurate measurements, especially since there are no right angles. The bottom edge of the sail (the part tied to the boom) is 83 degrees to the side tied to the mast, for example. This required measurements with a laughably small and primitive protractor. Even a small twist in the fabric would send the lines off course. To double check my work, I took the tarp outside and opened the whole thing on the driveway. I fixed a couple of wobbly lines and then set to work with my pocket knife. Two edges were wrapped in duck tape: the bottom edge, which will be tied to the boom, and the angled top edge, which will be lashed to the gaff. Making grommets was the most time consuming work, and a new experience for me. I was entertained (at least for the first few grommets) by the task to punching out holes with simple metal die, inserting two parts of the grommet and then tapping them together with a mallet and specially made metal punch. After about a dozen holes, the novelty wore off and I was ready to be done. The result can be seen in the photo. I also need to make the jib, but that’s a smaller and simpler project. Now that I know how to process works, I can get that ready in an hour or two. On to the next step. My eagerness to build boats and, at the moment, finish my Pocket Cruiser has one disadvantage: I sometimes forget to actually use my boats. Day after day, I tinker with my sailboat while my little green canoe sits unused in a corner of the garage. I made amends today by taking the “Six Hour Canoe” to a nearby lake. Arriving soon after sunrise on a weekday, I had the water all to myself and felt that nature was on full display for my private enjoyment. Birds filled the air and I lost count of the number of great blue herons I startled along the shoreline. I love the woods and generally take hikes in nearby state parks three or four times a month, but nature looks different from the water and animals act in unexpected ways. Soon after launching I noticed two deer in the treeline—a common sight in rural Pennsylvania. But they surprised me by casually wading into the lake and swimming to the opposite shore—maybe 200 yards across deep water. Their heads were all that I could see—two furry bumps on the calm surface, moving purposefully from one shore to the other. I had never seen deer swim. But, then, I had never seen deer from a canoe. I was on a large lake dammed and maintained by the Army Corps of Engineers. Farther down, it opens into an impressive body of water and is filled on summer days with dozens of noisy powerboats and jet skis. However, I launched in the upper reaches, far inside a no wake zone, a region used only by fisherman, most working the waters with quiet trolling motors. But even they were largely absent as I explored a deep inlet that eventually turned into a shallow marsh fed by a narrow but navigable stream. I paddled upstream until it become too narrow even for my canoe, found a spot just wide enough to turn around, and let the current take be back into the lake. 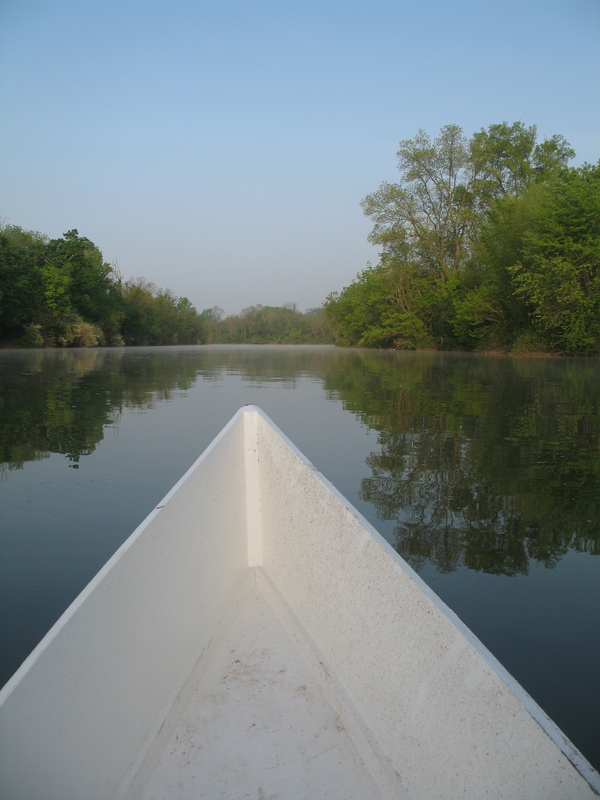 Hearing the grasses slide under and around my little boat as I rested the paddle on the gunwales, I felt inexpressibly happy. I was exactly where I wanted to be. I hugged the shoreline, working my way back to the parking lot as the sun started clearing treetops. I watched turtles sunning themselves on logs and felt quite self satisfied as I poured a mug of French roast coffee from my thermos and scanned the trees for birds, vowing—for the hundredth time—that I would eventually learn to identify more than robins and chickadees. This trip was also an opportunity to test a small modification to my canoe. The six hour canoe has a high rocker and flat bottom, which makes it hard to track on the water. During my first outings last fall, I noticed that it wanted to skitter around with each push of the paddle. In addition, the flat bottom was easily scraped when dragged in and out of rocky or sandy shorelines. To fix both problems, I decided to attach a small keel— a strip of 1×2 pine down the center of the hull. I tapered the ends and held it in place with six stainless steel screws (a dab of caulking at each screw hole helped create a watertight seal). I finished the job with a coat of paint. As I hoped, this small addition protected the bottom from scratches and did seem to help keep canoe on track. I felt like a veritable Daniel Boone (who was born nearby) with what I imaged to be my expert handling of a wilderness-worthy canoe. I’m sure I really looked like a middle aged guy on a manmade lake, but a couple of hours of solitude at sunrise can do wonders for a man’s fantasy life. Until very recently I assumed goosenecks were of interest only to geese and tabernacles were the natural habitat of Mormon choirs. Now I know that they are also parts of my boat’s rigging. Both were installed a few weeks ago. 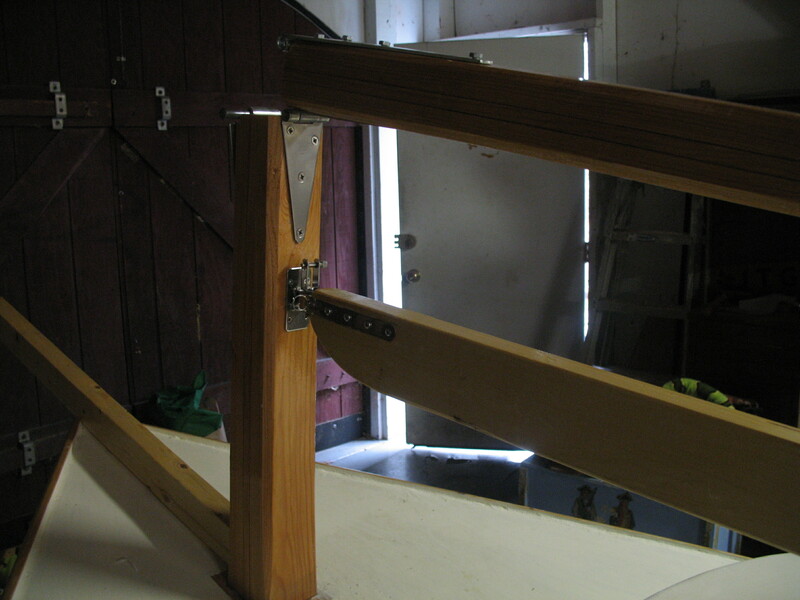 A gooseneck is an elaborate hinge that connects the boom to the mast. It allows the boom to swing sideways and also fold up and down. My boat’s designer included instructions for fabricating a sturdy gooseneck from iron rods, a short piece of pipe and some pins. But I’m impatient and also largely disinterested in metalwork, so I purchased a simple and serviceable gooseneck from Duckworks, my always reliable source for “exactly what I needed” boat building parts. The tabernacle is simply the lower part of a hinged mast. It sits upright through the boats cabin and with the mast. Creating the tabernacle was much more difficult—emotionally, at least. I built my mast some months ago and devoted two full weeks to its carefully assembly. Now I had to cut it down at its knees. The bottom four feet would sit in the previously assembled mast box and become the tabernacle, while the top eleven feet would be reattached with some sturdy hinges and serve as the mast. This allows the mast to drop for transportation without having to be completely removed and disassembled. To avoid mistakes, the rule is “measure twice, cut once.” But in this case, I think I measured a hundred times. I absolutely did not want to make a stupid mistake and cut the mast too high or too low. So only after reviewing my plans for the tenth time, did I finally take my circular and slice through the mast. The next step was to reconnect the bottom and top portions with hinges. The designer called for two 12 inch gate hinges, one on each side of the cut. This made sense; the hinges had to securely hold the mast upright. But I had a couple of problems: The largest gate hinge I could find was ten inches long and, furthermore I also discovered that my gooseneck got in the way; I could use a hinge no longer than six inches on the inside. A quick tour of boat building Web sites reassured me that many other builders had made similar modifications and that, in the end, the mast would be held up by the stays— which the nautical term for ropes that reach from the top of the mast to the hull below. The results strike me as functional, if not especially elegant. 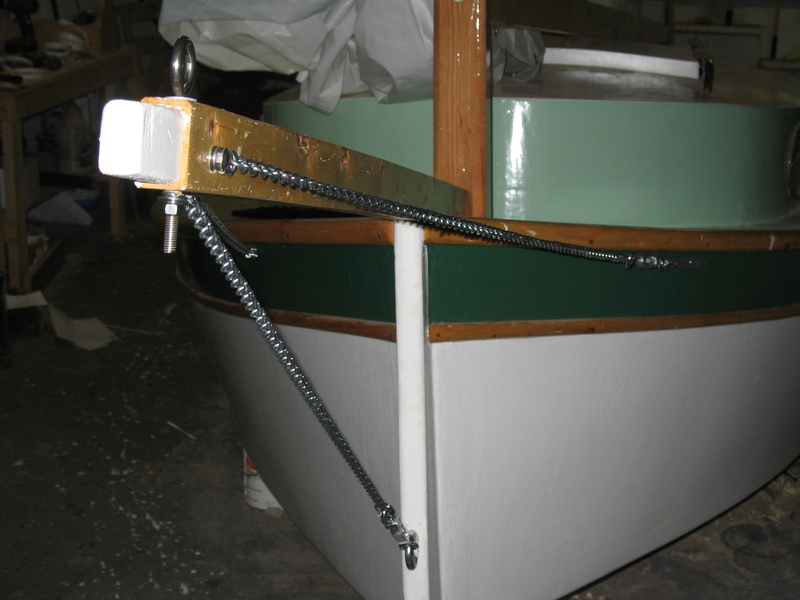 You are currently browsing the Build a Boat, Sail Away blog archives for May, 2011.